Interview of Dr. Velumani… says 20% CAGR growth is a conservative estimate. What happened to interim dividend? Agenda for 9th Feb meeting included it but don’t see anything about it. Did I miss it? Commentary from DLPL, Thyrocare and Metropolis CEOs. 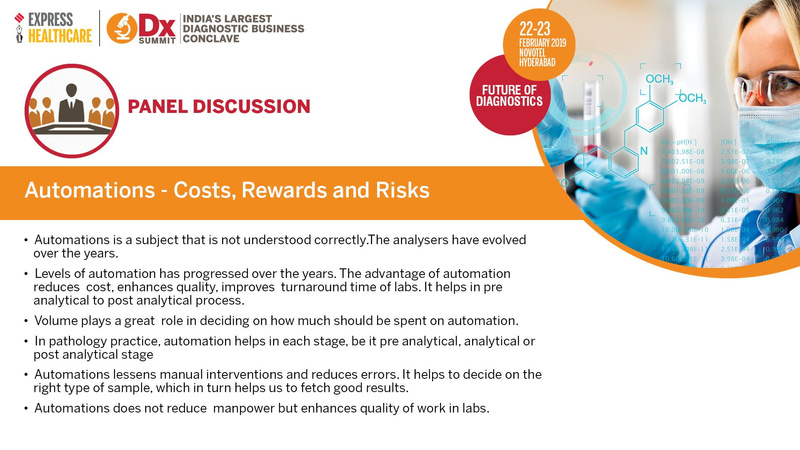 Express Healthcare is covering a Diagnostics Summit being held on Feb 22 and 23 in Hyderabad. Searching the below hashtag on twitter would give u highlights of sessions held during the summit. 7 min video with the session highlights from day 1 and day 2. Metropolis business is similar to Dr Lal’s (wide range of diagnostics). Thyrocare is focused on biochemistry and PET CT.
Offer price is 800. EPS was 20 last year, so PE of 40?? Dividend paid was 15 last year. No debt. Growing at about 18% in the last 3 years. But, there was no growth last year?